Here is yet another piece of art from my backyard. Simply put it is my dog in here favorite spot, soaking up the heat of an early morning sun as it crests the roofline of the house you cannot see. 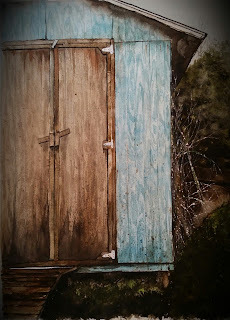 There is a lot going on in this seemingly simple painting but I will let you interpret it as you will. I again apologize for the poor quality photo. "Corona In Her Favorite Spot"
I messed around with a little pop art the other day and since aviation is technically my day job, I of course have a real affinity for the history of planes and pilots. It was really just an excuse to do something over my morning coffee. The original was a b&w photo from WW1 but I thought I'd mess around with the computer and give it a Warhol'esk look. It isn't a Campbell Soup can but I ain't no Warhol. French Ace Georges Guynemer was a great subject to colorize. 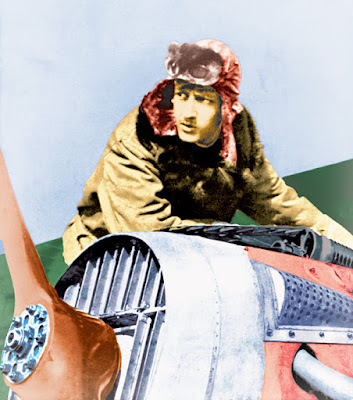 If you like history his story is a good one to research. Neglected as it is I do occasionally post new content to this blog, though not as often as I do to my Facebook Hexfishing page. Some content doesn't even make the transfer but since this blog is partly responsible for my elevation as an artist I endeavor to keep it alive. 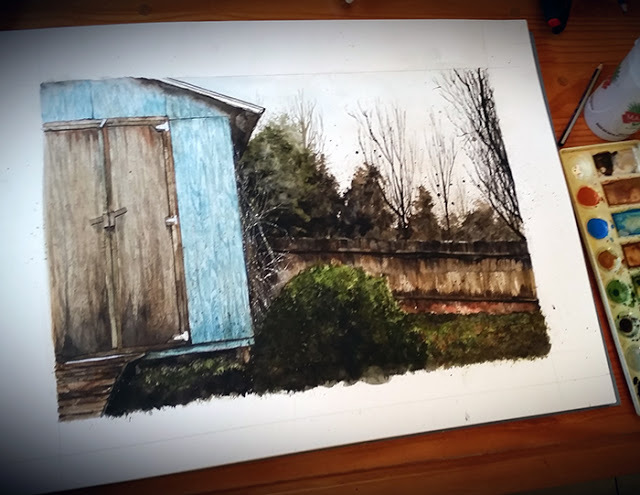 The other day it was raining hard and since I found myself a bit bummed at having been pushed out of my fishing plans, I looked outside my window and decided to paint my weather beaten shed. 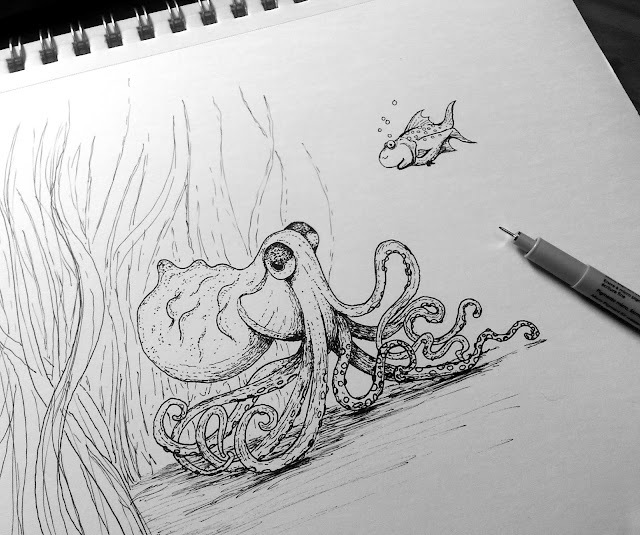 It fit my mood and was a fitting subject to practice my art on something less aquatic. 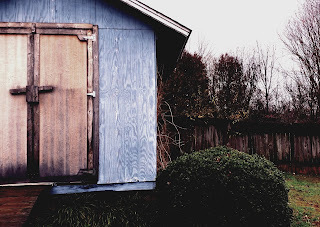 That day I saw the washed out blue of the shed, deep shadows that hid in a misty fog, and the on setting of winter in the trees behind my worn down fence and I decided that however drab it might have looked, it needed to be set down in paint. The bare wood of the door was once a neglected project but it has become a rustic addition to the aging shed. 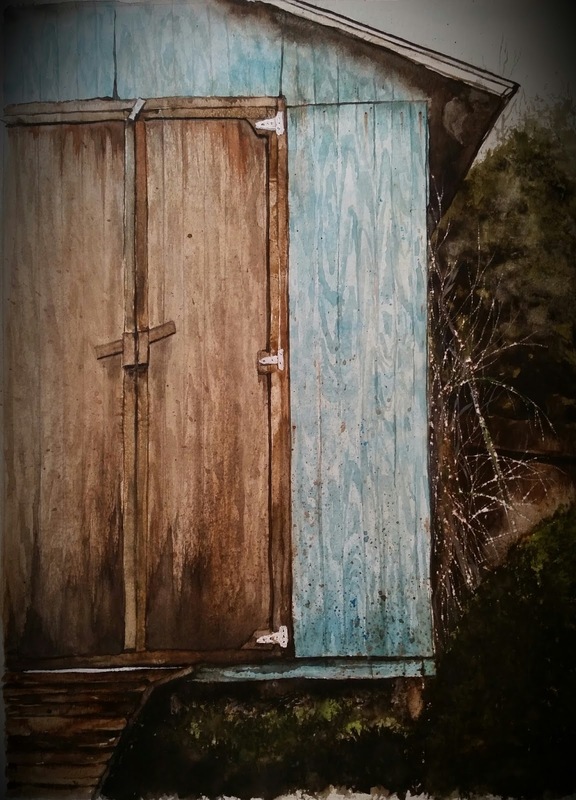 In this piece it served its purpose of vivid contrast to the fading blue and like a grand hero in some old novel, it still served a purpose despite the visible flaws. There is no need really to try to explain art to the audience since art is truly an experience every individual interprets on their own, but I can tell you what I was thinking as I laid brush and pigment to paper. 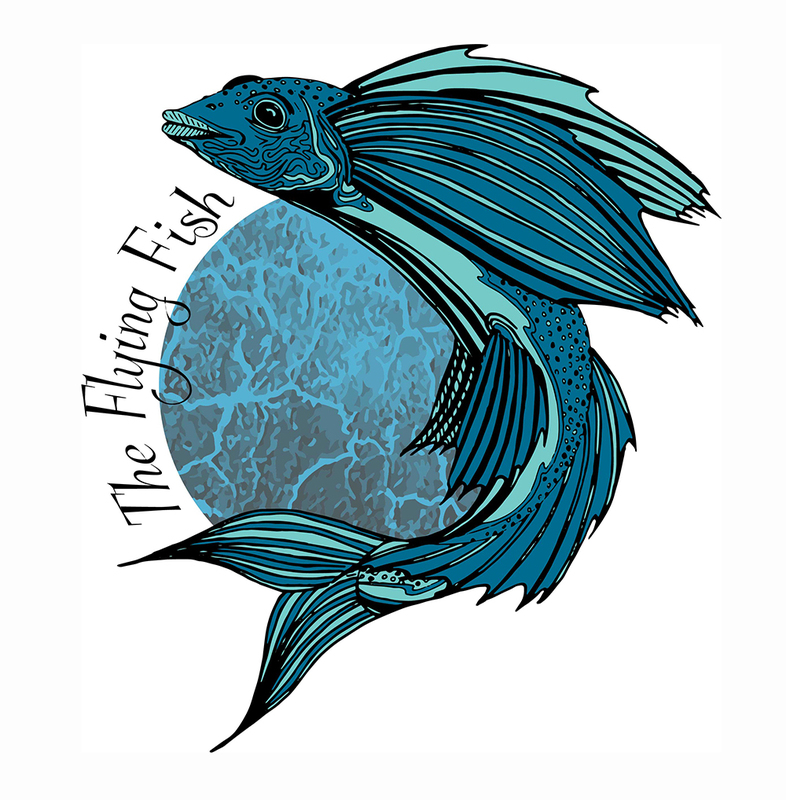 You will probably be seeing more artwork like this in the future and although you undoubtedly follow this blog for the fishy subjects, I appreciate your tolerance of my choice of subjects. I also appreciate your tolerance of the crappy cellphone pictures. 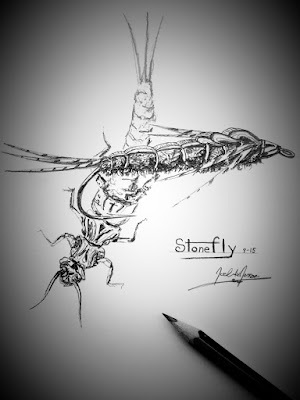 Never underestimate the power of the stonefly. 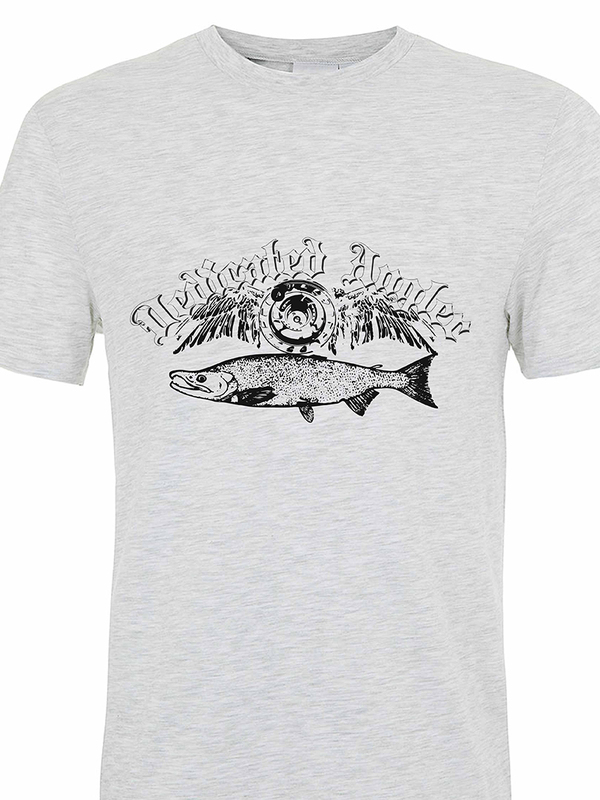 For the weight, there is few deep fishable flies that can beat it. Whether you drift it or drag it, a properly fished Stonefly will yield you some big trout. In my last few trips to the trout streams in South Carolina I have proven this concept yet again. Color and presentation mater but when you find the right combination to the streams entomology then you are in for a day of great fishing. Even comically large stones on small creeks can yield surprising results. On my last trip I lost three black stones in a size #10 to deep fishing at the base of a large waterfall. 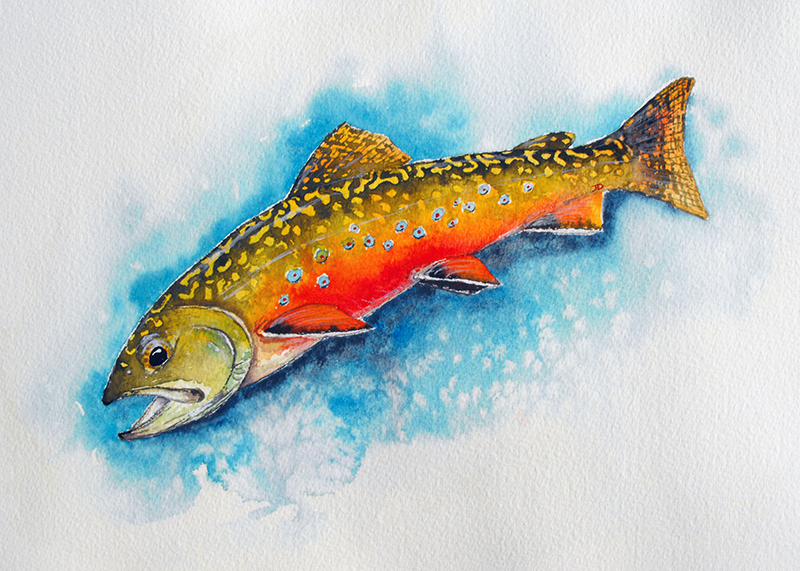 Two were lost to a submerged log and one to a large trout that took it running. I tied on a leggy molted brown stone with no results so I tied on the only other black Stonefly I had in the box. It was a stone I bought in Montana, the land of giants, in a size I was sure would scare small children and trout alike. The end result was trout after trout coming to the net with a big fatty cigar of a Stonefly hooked into the corner of their small mouths. I have thus come to the conclusion that as stoneflies are concerned, size matters little. Get the color right and you are set. I recently returned from a backpacking trip in South Carolina with my brother in-law. It was a great trip and even hooked into some really beautiful trout. Here is a short video of the trip. Enjoy. 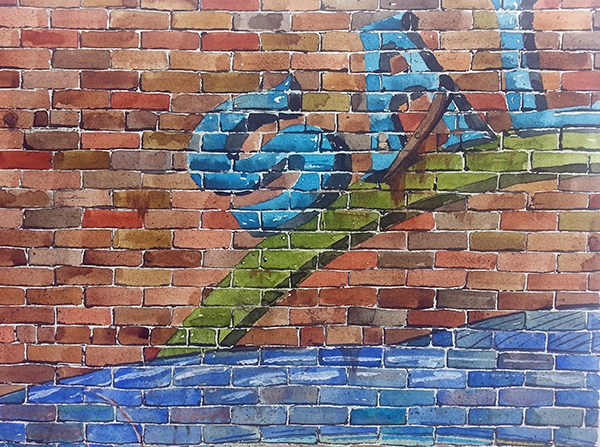 Ever see those big vintage advertising signs painted on the side of old businesses and think, 'that is pretty cool'? 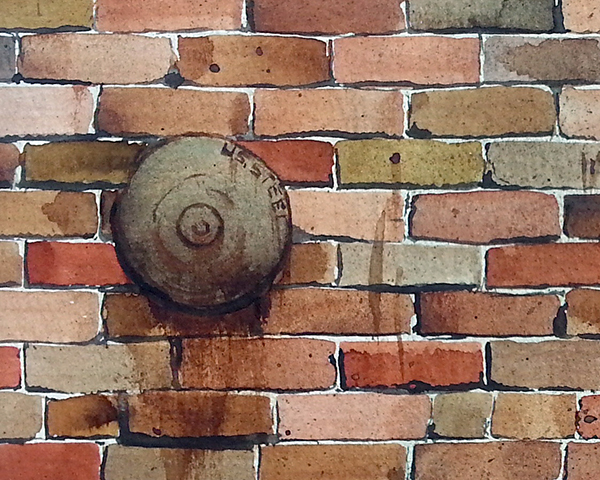 Well so did I and after toying around with the idea in my mind for a while I came up with this new watercolor. 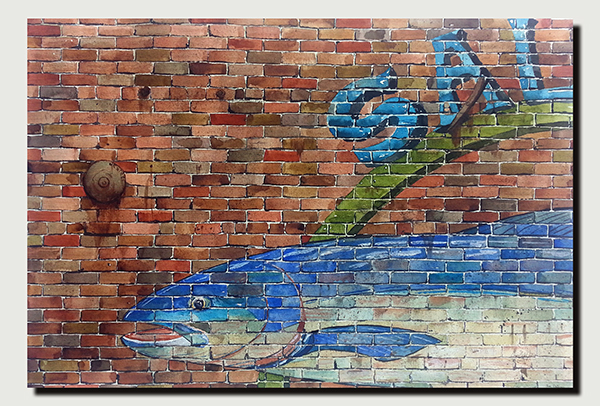 Based on a vintage Salmon cannery logo, I painted this brick by brick, adding in little details in every single stone. I took special care to add in the rust of age on various steel and metal parts that had been added to the building through the years. 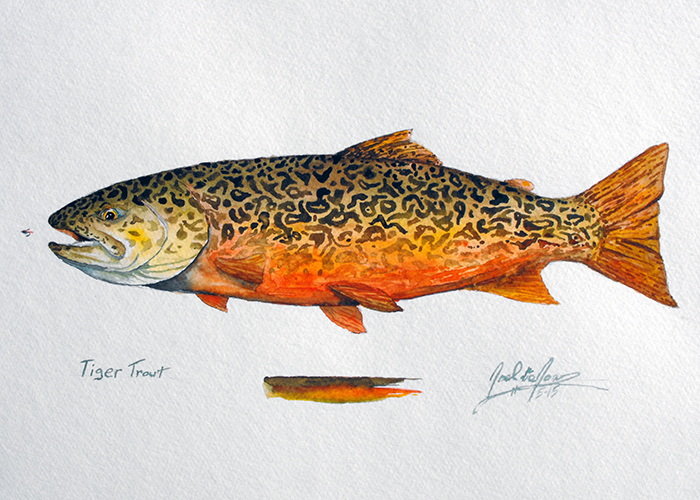 I wanted to keep the salmon basic on this piece as it would have been on any hand done sign painted on the side of a building. 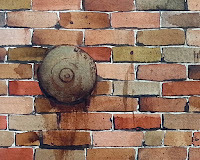 The varied colors of brick made for an interesting look and I am eager to get started on the next painting in this style. Not a normal painting for me but I thoughts I'd branch out and try something a little new. Saltwater reef fish are beautiful creatures and are often the subjects of artists as well as interesting species in any home or office aquarium. 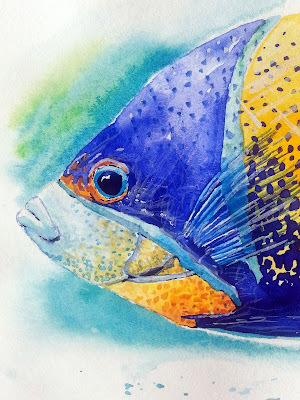 I was lucky enough to make it down to Mexico last month and do a little snorkeling along one of the many reef structures and was blown away by their beauty which is probably why I chose to paint one. 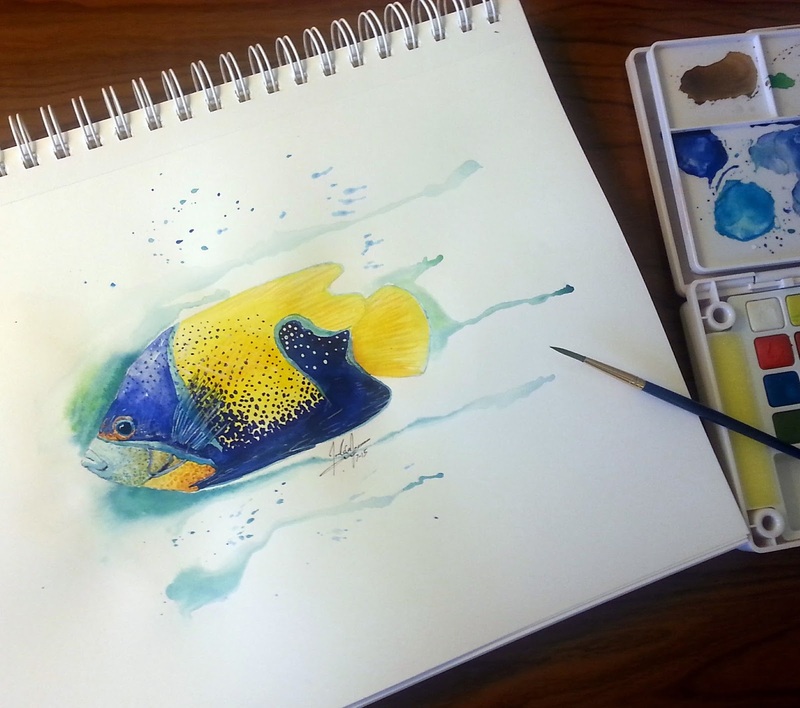 This particular species is one of the many types of angel fish that roam the reef. 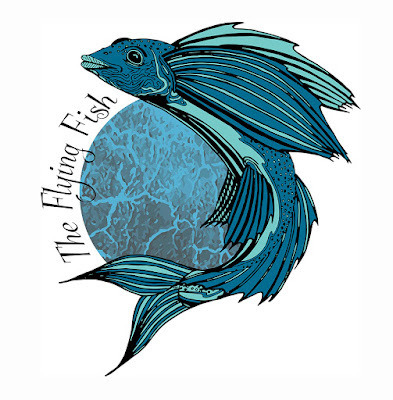 For the fresh water anglers out there you might find a striking resemblance to our own bluegills and sunfish. NEW Shirt Designs now available at my shirt shop. Choose the color and the size and have yours shipped out to you today. How dedicated are you? 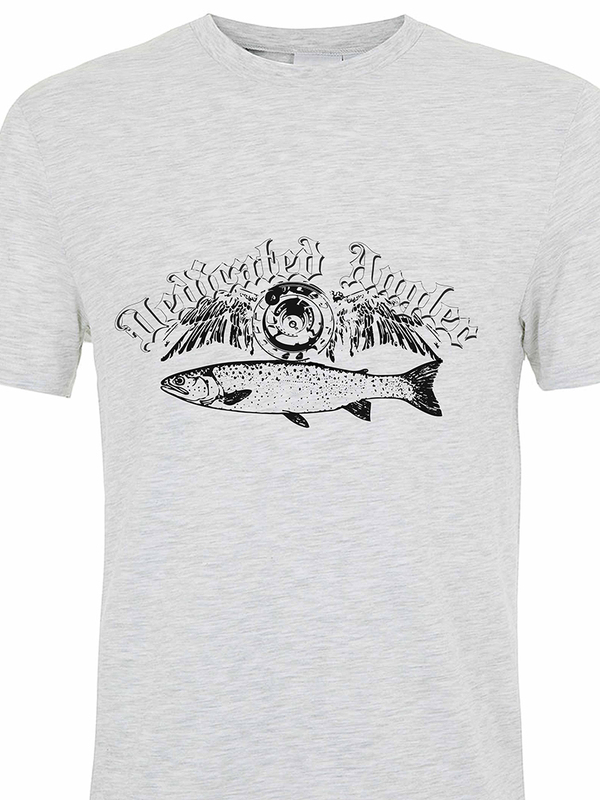 New Dedicated Trout Angler and New Dedicated Salmon Angler shirts available in a variety of colors and sizes. For fathers day I had the special privilege of rendering a record catch for one father from his sons. 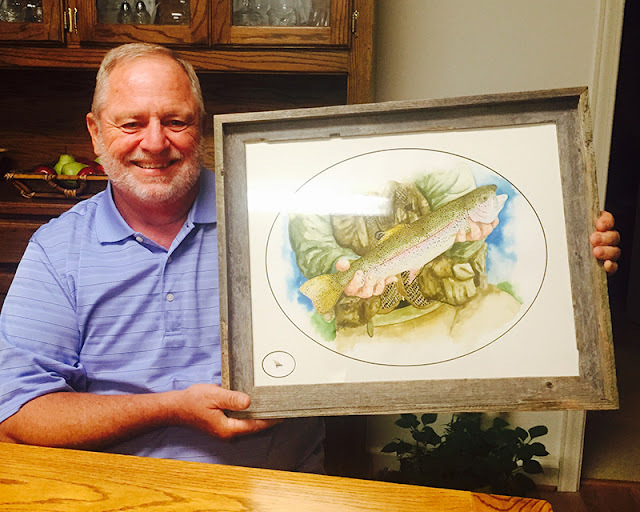 Caught in a North Carolina stream, this beautiful rainbow was an exciting experience for this angler and his sons wanted to surprise their dad with a wall hanger to remember it. 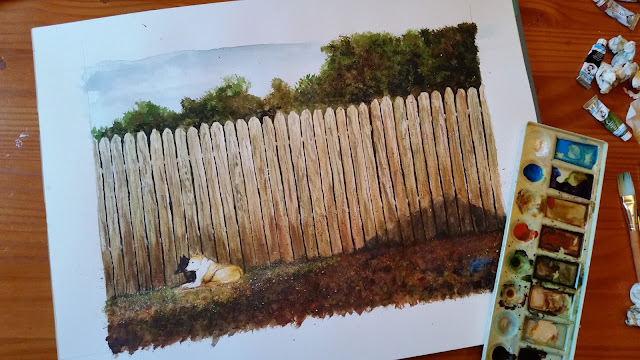 It had been a while since I picked up the paints so I was eager to get started on this piece. 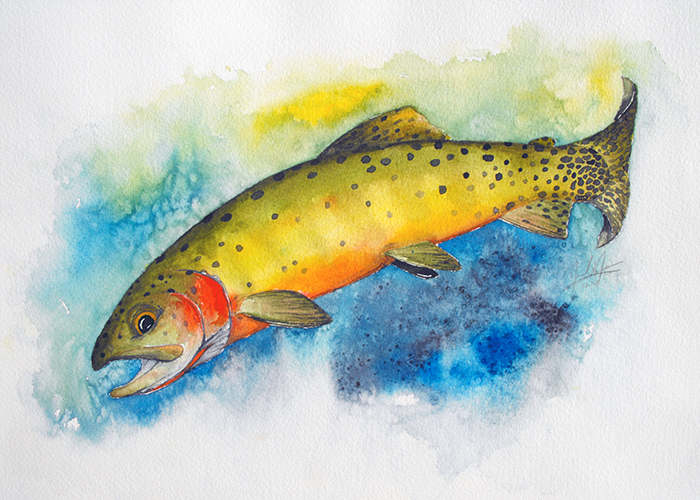 Painting fish not only fills me with joy it also serves to scratch my creative itch while keeping my love of fly fishing alive. I also get great joy out of seeing my work so appreciated by the people that receive it. I was told by John that his father absolutely loved the surprise and just couldn't stop staring at it after he received it. His smile was permanently set for a long time after the unveiling and it makes me just as happy to contribute to the joy he felt. 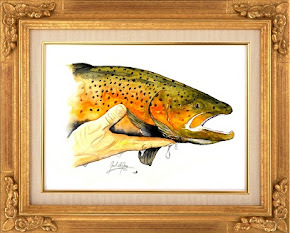 For this piece we added to the framing of the painting the actual fly he used to hook the trout that day which only adds to the special nature of this memory. Its time for a little self promotion. I am told I need to do this a little more to get my art out there but the truth is it just kinda makes me feel like a vacuum sales man. Anyhow - www.hexfishing.com - my art website has finally been updated to include some of the newer paintings I have done as well as some not previously up for sale. Some of these have made it to this blog and some quite simply have slipped through the cracks. Whether you plan on buying or just like to view paintings of trout, I hope you click on over and see my works Below are just a sampling of some of the paintings now available at unbelievably cheap prices for ORIGINAL artwork. I have also been asked 'why are they so cheap?' and the answer is simple - I enjoy painting them and frankly I cant have hundreds of my paintings just hanging around on shelves in my studio. 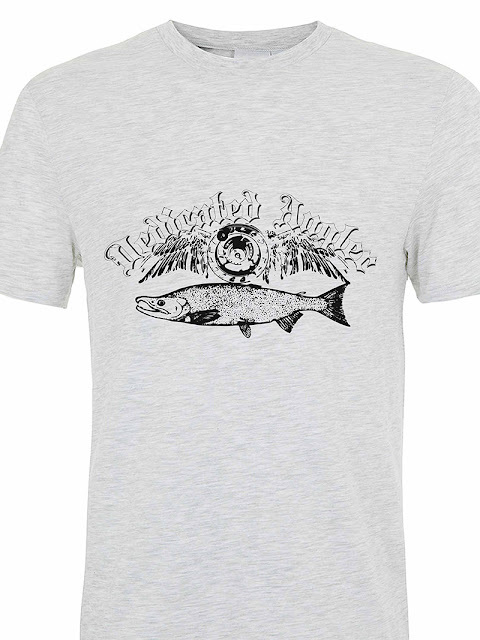 I would much rather put them in the hands of fellow anglers that can appreciate them. Check it out and share it with your friends. Old School Art & Being P.C. I passed through Knoxville a little while ago and came across a few examples of some old school art on southern money. For all those out there complaining that there has never been a woman on our paper currency, (Sacagawea has her own dollar coin in case you forgot) I say look to the past and look to the south. The Ocoee Bank Of Tennessee not only placed a southern bell on their $10 note, they also included a Native American and an African American (and two horses). I'm not a big fan of removing key founding fathers from our national currency in the name of political correctness (anyone who knows me knows P.C. is a not my forte anyhow) but if we ever issue a new denomination, I am fine with a deviation from the norm. 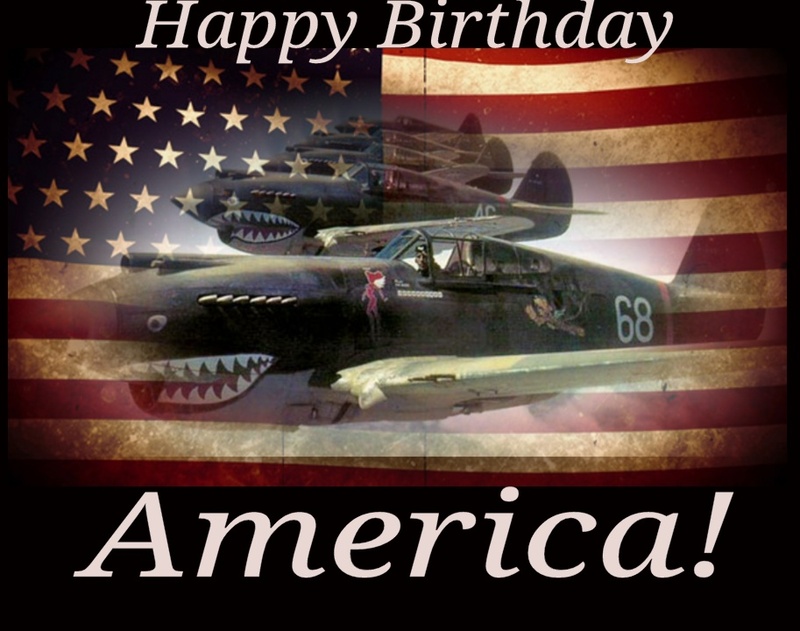 I nominate Sitting Bull for a new $25 note, Betsy Ross for the $75 note and, G.W. Carver for the $150 bill. Who's with me? How cool would a $25 bill be? Nothing much to say about this one other than it has already been spoken for before it made it here. 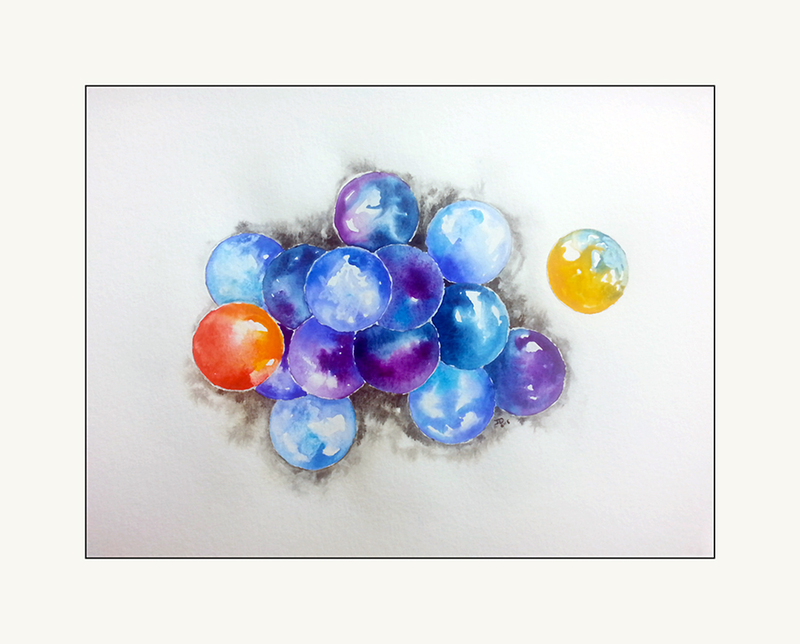 It was a practice piece just to keep me involved with the color flow and to practice my watercolor skills. 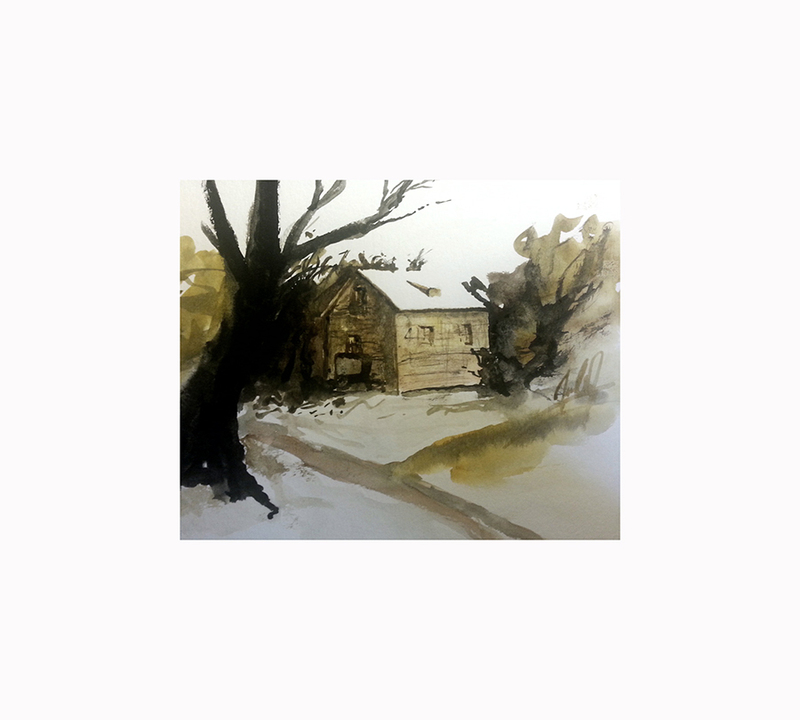 This one was just a simple sketch done a few moments before the marbles. I did this in a rough style and under five minutes just to get my mind going. 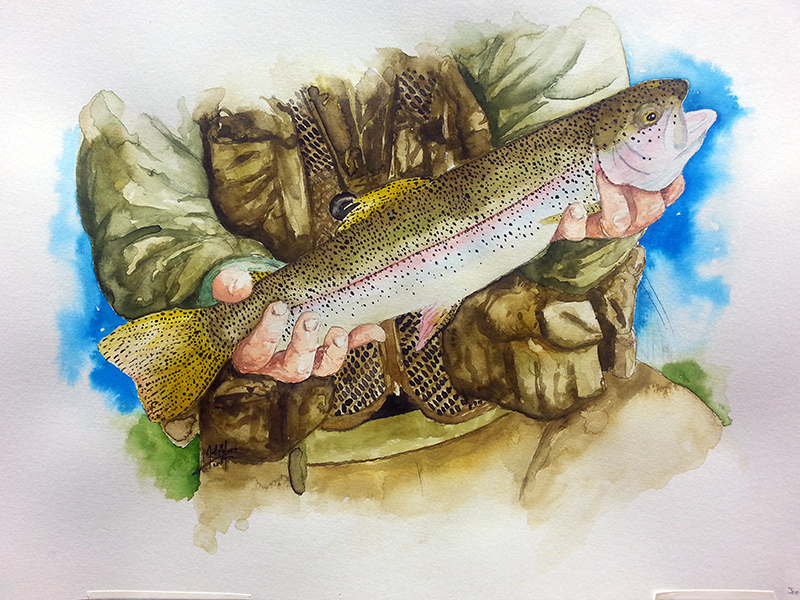 Yes, none of this has to do with fish but its what I have been up to so I thought I would share it with you. That was the grayling season! A new Trout Fishing Video and a new Bass Yakin Video. Short but sweet. How To Find The Right French Restaurants In Melbourne, Austrailia? The recovery is on for Central North Carolina's Deer Herd..... Threeletters EHD. Has it really been over a year? Just a few images with my new camera body. A short thankful Wednesday. Someday I will come up with a new blog idea, but not today. A Move to Mecca, Rutland Water. On January 1st 2010 I started posting one original painting or drawing a day for an entire year. 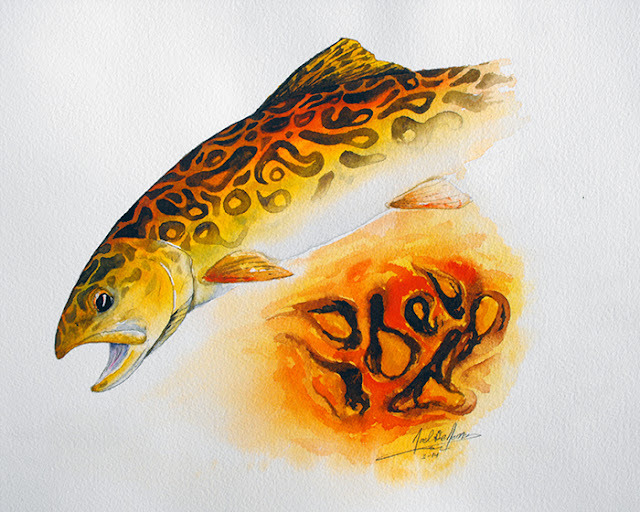 On December 31 2010 my mission ended but my love of catching fish and painting them lives on. So this blog lives on. Fly Fishing Art with Fishing reports and Gear reviews, this blog is your source for all things fishy. 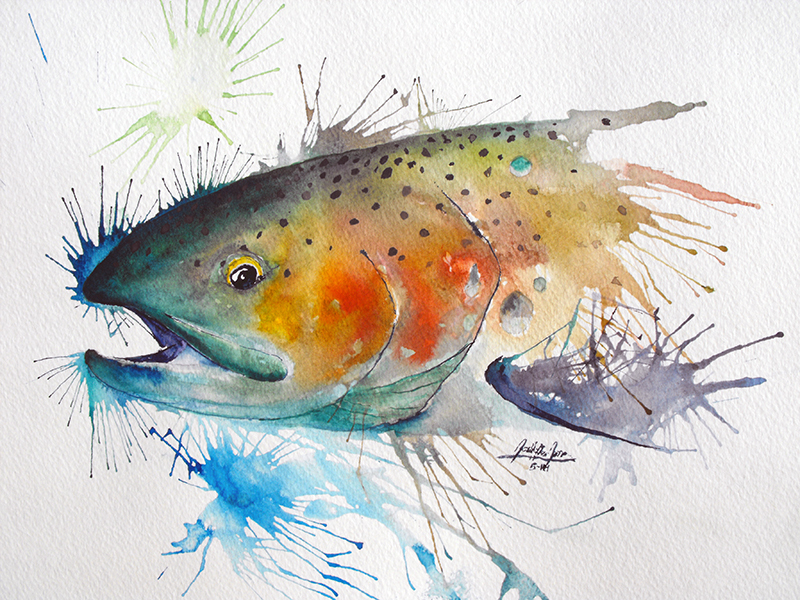 If you enjoy fly fishing and the art of the fly or fly tying, I hope you enjoy this blog. 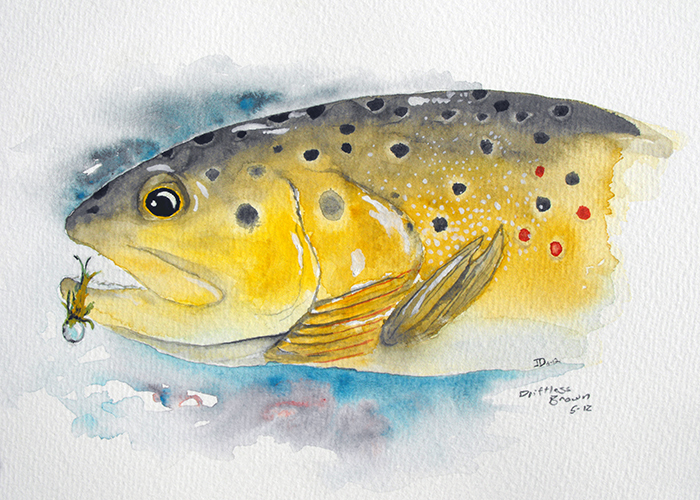 Most of the paintings posted here are for sale as well as the Fish Prints so if you are interested in any of the art here please Email me at jmdjdejong@gmail.com for details or just visit the BUY A FISH PRINT pages.